l. Heat the oven to 190ºC/375ºF/Gas 5. Brush the tart pan with oil. Cut the Gruyère cheese in small dice and the goats’ cheese in 6-8 slices. 2. For the cream puff pastry: Sift the flour onto a sheet of paper. In a small saucepan heat the milk, salt and butter until the butter is melted. Bring to a boil, take from the heat and immediately add all the flour. Beat vigorously with a wooden spoon for a few moments until the mixture pulls away from the sides of the pan to form a ball. Beat ½-l minute over low heat to dry the dough slightly, just until it starts to stick to the base of the pan. Take the dough from the heat and let cool 2-3 minutes. 3. Beat the eggs one by one into the dough, using the wooden spoon or a hand held electric mixer. Adding just the right amount of egg is key to cream puff pastry, so break the last egg into a small bowl, whisk it with a fork to mix, and add it a little at a time – you may not need all of it. At the end the dough will be shiny and should just fall from the spoon. Beat in the diced Gruyère cheese. 4. Spread the dough evenly in the tart pan using the back of a spoon (for a more rustic effect, simply spread the dough in a round on an oiled baking sheet). Sprinkle with herbs, and garlic if using, leaving a 2cm/¾in border of dough. Top the herbs with rounds of goats’ cheese — the dough will show between them. Brush the cheese rounds with olive oil. 5. 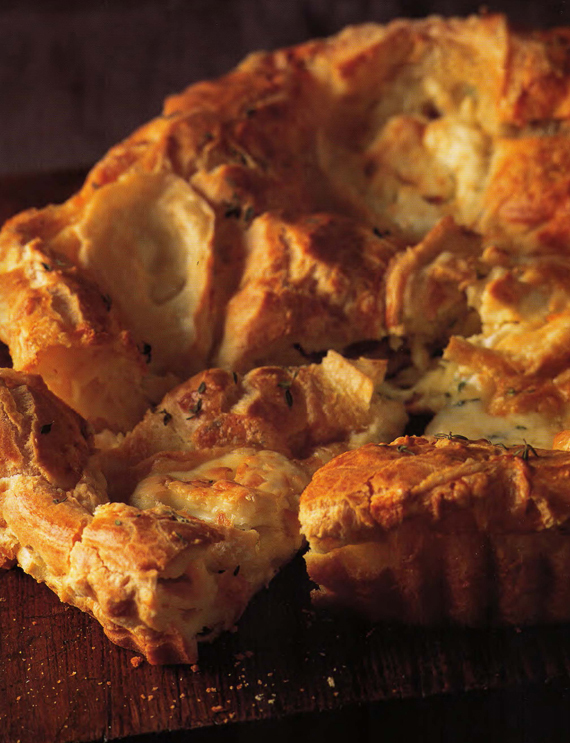 Bake the gougère in the oven until the dough is crusty and brown and the goats’ cheese is toasted, 45-50 minutes. The gougère will puff, then deflate slightly as it cools. Serve it warm, cut in wedges. Shortcut: Individual gougères, each topped with a round of goats’ cheese, will take 10-15 minutes less to cook. Getting Ahead: Gougère is best eaten at once, but it can be baked 2-3 hours ahead and reheated. On the Side: In winter I’d favor a bowl of Conte Rocco’s Minestrone, and in summer a hearty salad of vegetables. You might like to try the Bulgarian Vegetable Salad. In the Glass: Gougère is Burgundian in origin, customary accompaniment to a chilled glass of Kir (dry white wine with a teaspoon of Cassis blackcurrant liqueur), or a fruity red Beaujolais. I want to try this recipe right now!